The Voreia Beer was the major sponsor of the new music show of Natasha Bofiliou, which during this summer traveled along Greece and abroad. 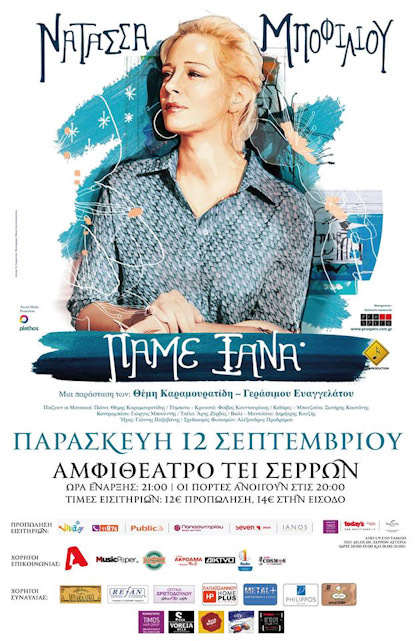 The grant (sponsorship) concerns the concert that was performed at the Open Amphitheatre of the Technological Institution of Serres on Friday, the 12th of September 2014. The new show of Natasha Bofiliou excited the audience wherever it was held, during her summer tour at selected places in Greece and abroad. “Let’s go Again” was the title of the super-successful show that combines the songs that we already loved from her recent cooperation with the important composer, Stamos Semsis, with songs from her personal repertoire, that made the artist one of the most popular singers of her generation. Mr Themis Karamouratidis and Mr Gerasimos Evangelatos, who are always at her side, set up an incredible music program, designed to make their songs completely different, but also aiming to experiment with famous and important hits of the Greek music scene. The performance “Let’s Go Again” shows different aspects of talent of Natasha Bofiliou, confirming that she is the new power of Modern Greek music. The Microbrewery of Serres and Northern Greece «Siris MicroBrewery» within the social corporate responsibility supports, among other things, musical and artistic activities that promote culture, art and our country, and thereby safeguards our precious heritage and supports the effort of artists.